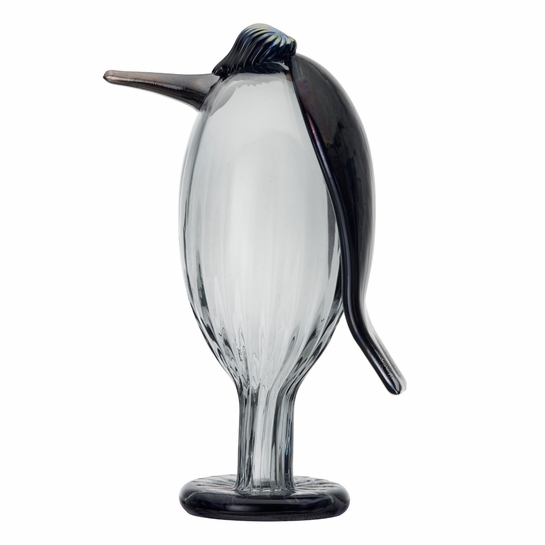 More about iittala Toikka Waiter Cordial colleague to the Butler, the iittala Toikka Waiter is the more petite of the pair but certainly equally exquisite. His rigid posture is captured in a single piece of clear, mouth-blown glass with ridged detailing, following the fluid form from the top of his head down to his firmly planted feet. Waiter takes the same pride in his appearance as he does in his work, sporting a formal dinner coat with a flared out tail as well as a freshly combed and sparkling clean hairstyle that has been handcrafted from opalescent glass. His long, pointed beak is held perfectly straight as he dutifully awaits instruction. At the end of the day, though, Waiter is more than just staff; he is a part of the family.